Ever wonder why your home power bill is so high? 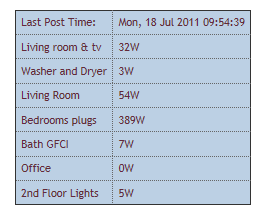 Or just want to know how much power you use in various parts of your house through the whole day? 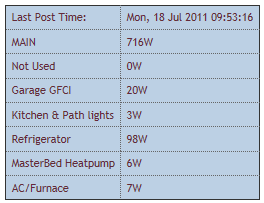 I have one of the Blue Line Power monitors for Microsoft Hohm (http://www.bluelineinnovations.com/Products/PowerCost-Monitor/). This product did not allow me to see how much a single room or circuit was using. It was a start. I have the LCD display in my living room near the TV so that I can quickly see how much energy my home is consuming. For my 30th birthday I got all the parts I need to do per-circuit power monitoring for my whole house. By doing branch circuit monitoring I can answer many questions about my enery usage. 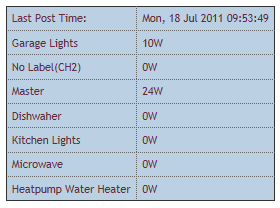 How often does my water heater (http://www.geappliances.com/heat-pump-hot-water-heater/high-efficiency-water-heater-savings.htm) turn on. Or in my case thanks to Insteon I can turn it on before I leave work! I installed solid core CTs on each breaker on my home circuit panel. To hold the ECM1240 brains I installed a PVC box just next to my main panel to hold all the low voltage items. The ECM1240 allows me to view my data in real-time via the my1240.com website, read the data from google powermeter or push it into my own data collection environment. The software to manage the 1240 collection devices has more bugs in it than Windows ME. It crashes often and overall is a piece of junk. The solution by default only supports Google powermeter not www.Microsoft-hohm.com. 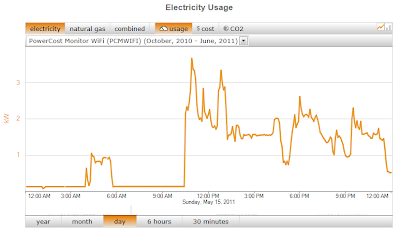 With Google Powermeter and Microsoft-hohm.com being retired I will have to find a new way to view my power data. Mike - are you still using this? or did you upgrade to something else?